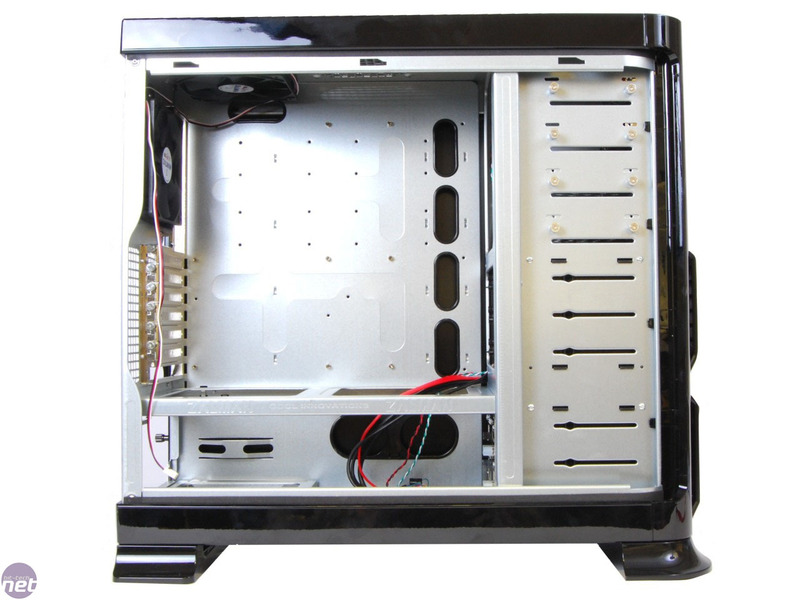 There are 120mm top and rear exhaust fans, with mounts for a further 120mm fan in the roof and two more 120mm models in the base of the case in front of the PSU. 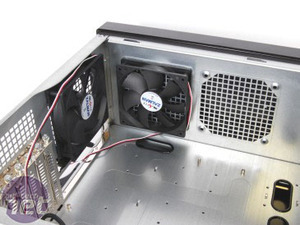 It would be possible to fit a double 120mm fan radiator in the roof with a bit of modding and you'd almost certainly want to remove that roof vent. Maybe Zalman could consider a plain mesh cover instead of the vent in the next revision and take substance over style. The only other internal location for a radiator would be in the bottom 120mm fan mount but you'll be very limited in space with the PSU right next to it. There are four externally accessible 5.25in bays, each with fixed, sprung thumb screws so installing optical drives and the like is relatively hassle free. Another inclusion we liked which should allow for much more rapid cable tidying are the numerous routing holes in the motherboard tray. By using an extension for the 8-pin EPS 12V cable (included with the GS1000 Plus), we were able to route pretty much every major cable behind the motherboard tray. It means if you start building your PC in the morning, in the afternoon you can be playing TF2 instead of cable tidying. The PSU bay is essentially unrestricted as far as PSU length goes, so Enermax Galaxies and the like will have plenty of room. 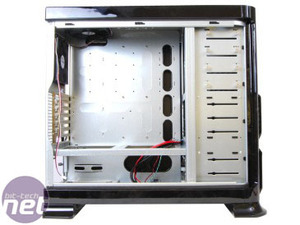 The PSU slides in from the rear of the case and is secured with a plate which screws to the PSU and then to the case. 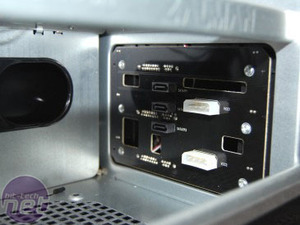 There's a handy routing hole in the bottom section to feed PSU cables into. Zalman has also included speed reduction cables for each of the fans (including the slim 92mm models in the front). These allow 5V or 12V to be sent to each fan and luckily this went a long way to quietening them down. Read on to see how minimum and maximum fan speed settings fared in terms of temperatures in our tests. There's plenty of room between the panel and the motherboard tray too, so tucking SATA cables and the like out of the way is easy. 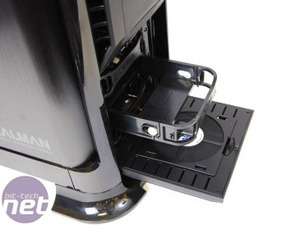 To further aid airflow the PCI expansion slot covers are vented which, apart from the front drive bay gadgetry, is the only difference we could see between the GS1000 and the Plus. 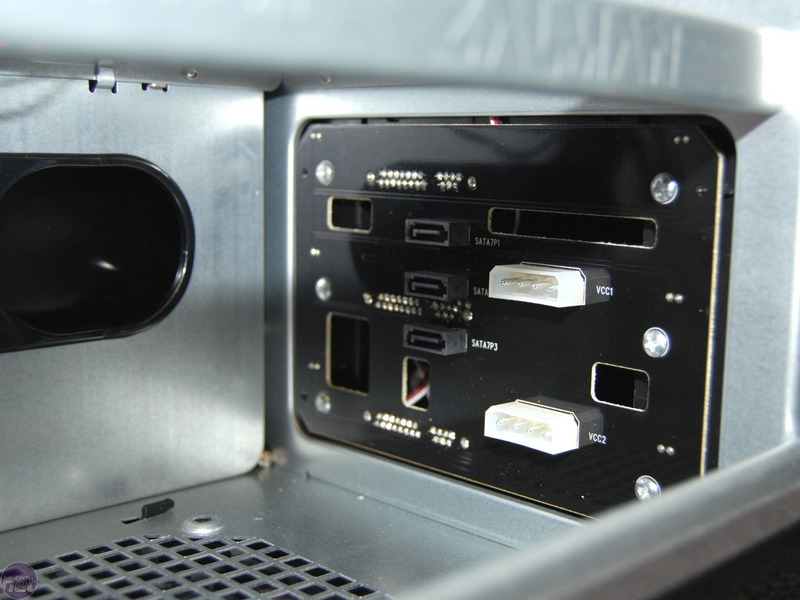 Without doubt the thing we most like about it though is the awesome cable routing which should make it easy to build a neat and tidy PC that's free from cable clutter.